A couple of weeks back we got a new puppy. We have always had two large dogs that are now about 9 years old and we thought a puppy would help them feel a little younger. What I didn't anticipate was the fact that my youngest son is very jealous of anyone or anything that takes away mommy's attention. He has been having a number of temper tantrums and thinks that the puppy doesn't love him enough if it pays attention to anyone besides him. It has gotten better slowly, but it is a work in progress. I do think that it is helping my youngest to have more responsibility and understand that there are things besides mommy in the world. I'm hoping that kindergarten will be an easier transition in a couple of years. In order to make my youngest son feel better I have been making some of my kids favorite foods this week. Both of my kids love salmon. There are a number of foods that they turn up their noses at, but salmon has never been one of them. 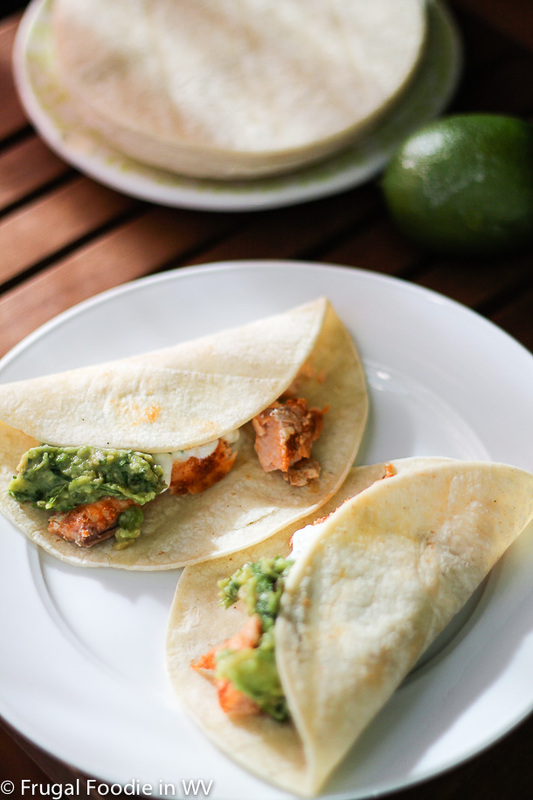 Last week I made a new recipe for Salmon Tacos with Guacamole from the January 2013 issue of Family Circle magazine. This recipe has 14 ingredients. It takes 15 minutes of cooking time, 15 minutes of prep and makes 4 servings. I had no problems finding any of the ingredient at my local grocery store. I chose not to make the rice part of the recipe. Since it was pre-packaged and seemed unnecessary I omitted it. Normally I would have bought quality salmon. However, my husband had bought skin-on wild caught frozen salmon a few months back. I am trying to use foods that we already have in the pantry or freezer so that is the salmon I used in this recipe. My salmon took slightly less than the 15 minutes of cooking suggested by the recipe, closer to 12 minutes. I followed the remainder of the recipe as written. These tacos were very popular with my family. My two boys loved the salmon and ate it without the tortillas. The cilantro lime yogurt was a nice addition and it was my favorite part of the recipe. It made a nice sauce with or without making the salmon as a taco. For the recipe go to Salmon Tacos with Guacamole. Have a great day also, come back again soon :) Going over to check out your blog now! Hmmmm, my boys don't normally like seafood, but I am wondering if the Guacamole would cover the taste enough for them to actually eat it. Yum! I think I will have this for lunch today! I think my husband would love this! He requests fish tacos quite frequently. I am a big salmon fan! This looks terrific and can also be made as a low fat version. As I am dieting now so this is a good meal choice! I love salmon also :) It could definitely be low fat, just leave off the guacamole. Hi back :) Going over to check out your blog now! Ohh sounds like it would be delicious. I will have to try this recipe sometime. Congrats on the puppy, too. We have 2 dogs and 1 cat, and it does teach the children responsibility. Thanks :) Our two older dogs are still adjusting, but it has helped them be a little more active, which is great since they are almost ten now. If you try the recipe tell me how it turns out! These look REALLY good! I like fish tacos and I also have some wild skin-on Salmon in my freezer. The sauce sounds divine. Beautiful photo too! This looks really good! I may need to try them. This blog is great! Thanks for visiting mine as well. I'm now following yours and will subscribe to emails as well. Thanks for stopping by and following :) Come back again soon!